The Nuova Simonelli Aurelia II Espresso Machine is a truly awe-inspiring commercial device with all the features that will make your baristas work at their best. When your employees have great equipment, it’s simpler for them to do their jobs. Morale is high when they get to work with the best machines and greatest, quality ingredients. You likely have incredible coffee that they’re proud to sell. This is like the icing on the cake for your shop. The outside of the machine itself is what will catch everyone’s eye. 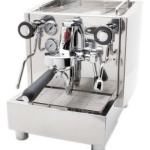 The Aurelia II has a number of group heads that will enable your baristas to make as many cups of espresso as needed for your busy establishment. It’s a wide machine that needs plenty of room on your counter. It’s never an eyesore, though. Even though it needs a bit more real estate than another machine, it’s a beautiful espresso maker that is quite impressive. The machine is safe for your baristas to use. It’s comfortable, too. When they’re pulling espressos all day long, it should be easy and safe for them to do so. Across the entire surface, it’s bright and well-lit. Your employees will never be surprised by steam that can burn. The back is angled for employees to see the coffee leaving the spout. This reduces the chance for burns. The LED lights by the nozzles can light up the jug of milk as you’re using the steam wands. These are all ergonomic features that keep your employees safe. There are temperature control displays, T3 technology systems, and graphic displays with multiple colors. 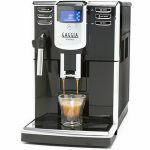 All these features give you versatility and control over the various aspects of espresso making. For example, the T3 system references the water supplies temperature accuracy. Each group can be set independently to different temps. Whether it’s the water, group itself, or the steam wand, the temperature can be controlled by the barista. The first moka pot, which became a staple for espresso production at home, originated with an Italian engineer. The drink originated in Italy, so when you can have an espresso machine in your shop that is made in Italy, that’s always a pretty good thing. 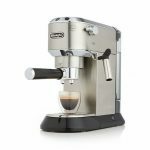 While it’s not necessary to purchase a machine that is made in Italy, it does add some authenticity to your espresso drinks. Customers will appreciate that your Italian-made machine is making this iconic Italian coffee drink. This is yet another great safety feature of this espresso machine. Your workers will never grab the wand and scorch their fingers. The outside of the wand is completely cool to the touch. With a cool touch wand, you’ll never have to worry about milk becoming encrusted on the wand. It makes the wand safer for your employees and cleaner for your customers and guests. Along with the temperatures for the group or the water, the baristas have complete control of the pump. It doesn’t require the services of a technician. That makes the life of your barista much easier. 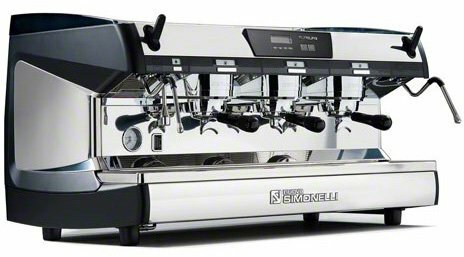 In both 2012 and 2014, the Nuova Simonelli Aurelia II was picked as the official machine of the World Barista Championship. It was an honor that was bestowed upon the company twice within a 2-year period. Does the machine have automatic cleaning? Each group can be cleaned individually. It can be carried out during business hours, too. There is no need to wait until the end of a busy day to clean the group heads. Can the machine be customized with different group heights? If you want to make tall drinks in one of these machines, you can get a raised height group. The regular height is 80 mm while the raised height is 125 mm. 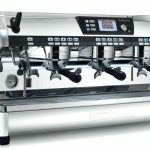 Is this machine suitable for demanding coffee shops with hundreds of customers per day? This is the perfect machine for a high-volume shop. With the four groups, you’re going to have a higher volume of espresso production with this machine. It might not be a good choice for a shop that only has a dozen espressos ordered per day. The Nuova Simonelli Aurelia II Espresso Machine has features like ergonomics to make the baristas’ life much easier. Your employees will appreciate that little details like sightlines and well-lit wand areas are on your mind. They’ll know that you care about their well-being and satisfaction with their jobs. It’s a beautiful machine that will look sleek and capable sitting on your store or cafe’s counter. Customers who see it will know you’re serious about producing the best espresso possible for their enjoyment.